Cauliflower soup is something that could be incredibly boring — but it certainly doesn’t have to be. This thoughtful recipe from “America’s Test Kitchen” cooks the vegetable two different ways to attain maximum flavor mileage. Pull off outer leaves of cauliflower and trim stem. Using paring knife, cut around core to remove; thinly slice core and reserve. Cut heaping 1 cup of 1/2-inch florets from head of cauliflower; set aside. Cut remaining cauliflower crosswise into 1/2-inch thick slices. Melt 3 tablespoons butter in large saucepan over medium-low heat. Add leek, onion, and 1 1/2 teaspoons salt; cook, stirring frequently, until leek and onion are softened but not browned, about 7 minutes. 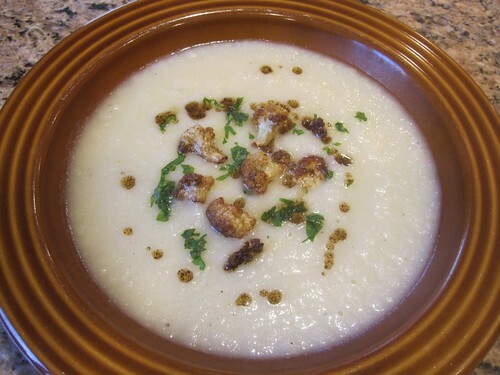 Increase heat to medium-high; add 4 1/2 cups water, sliced core, and half of sliced cauliflower; and bring to simmer. Reduce heat to medium-low and simmer gently for 15 minutes. Add remaining sliced cauliflower, return to simmer, and continue to cook until cauliflower is tender and crumbles easily, 15 to 20 minutes longer. While soup simmers, melt remaining 5 tablespoons butter in 8-inch skillet over medium heat. Add reserved florets and cook, stirring frequently, until florets are golden brown and butter is browned and imparts nutty aroma, 6 to 8 minutes. Remove skillet from heat and use slotted spoon to transfer florets to small bowl. Toss florets with vinegar and season with salt to taste. Pour browned butter in skillet into small bowl and reserve for garnishing. This was a simple recipe that is very creamy and tasty! Love the garnishes you could add on top. From the chives, roasted cauliflower, cheddar cheese, bacon, etc. Glad you enjoyed this recipe and your topping ideas are brilliant!